[June 13, 2019] Program Management for Controlling FAA Certification Projects | The Drake Group, Inc.
We start with a session regarding the need to have a written specification or TC STC PMA project description… simple ones for simple projects and more voluminous for bigger projects… but we need one to keep us organized and all on the same track. We will look at some examples. While this subject was addressed earlier we stress the need to pick out good DERs, DARs, ODAs and project advisers. Managing the efforts of these FAA designees is sometimes difficult. We present some techniques that may be beneficial in organizing and monitoring the efforts of these FAA representatives. The compliance checklist are the detail regulations we must address and how we plan to show compliance for each one to the FAA offices. We will look at some simple checklists and some more complex formats. We also review why the FAA considers this document so important. 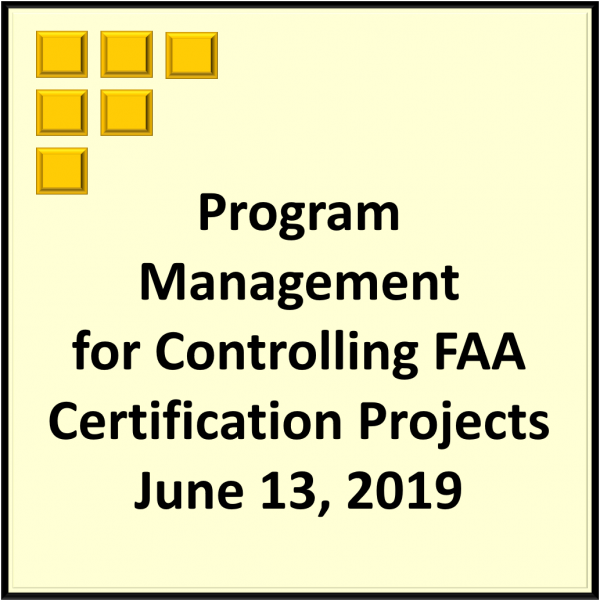 The master drawing list and the master report list is a management tool for both the project manager and the FAA offices. We examine how the MDL/MRL evolves from an early planning document to a final report with exact detail. A certification schedule, like most project schedule, probably causes the most ulcers than any single certification element. We analyze how to structure a schedule for a certification project and how not to…. A close second in the ulcer department next to schedules, budgets for certification projects are less traumatic if created in detail. We show a way of generating a budget that has a better chance at getting the job done. With the previous items started, we can now draft a PSCP, a Project Specific Certification Plan. We look at what should be in a PSCP and how the FAA regards this document. We also look at who needs to sign the document. Sometimes a subset of the previous PSCP, the conformity plan is probably the most mis-executed part of certification for new FAA applicants. We review what should be in a conformity plan in terms of line items, persons, locations conformity requests and delegations. Even the “big boys” with lots of cert experience stumble on this issue of conformity from time to time. While this is a subset of the previous conformity plan, conformity inspection tracking is worthy of its own session. A project can have a beautiful plan but the secret is in the tracking of the plan throughout the project. We look at some ways to track our many conformities… both in house and at our suppliers. Keeping tracked of what paperwork is being sent to the FAA and the status is a full time job on some larger projects. It is, at minimum, a job that someone must step up to on smaller projects. We examine how FAA submittal tracking can aid both the applicant and the FAA program manager. We all hate them, but periodic status reports are necessary when we have a lot of people working on a complex project. There are simple ways of making the job of creating the status report easy such that they can be created even if you are away for a few days. Communication between two people is hard enough… communication on a complex project between numerous people, in numerous locations, with numerous organizations can be single element that makes a certification project able to handle changes as they appear. We offer tips that can reduce the “communication gap”.